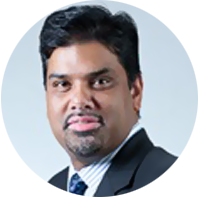 Raj is a senior banker with over 20 years of experience in multiple geographies with hands-on experience on revamping banking set up with extensive experience of setting up processes, policy, operation, IT infrastructure and new product launch and designing new digital led business models. Raj is a qualified Chartered Accountant, Company Secretary and MBA in Finance. Out of last 20 years he has spent 9 years in the emerging economies of East and West Africa. He has a rich and extensive experience in revamping the banking and financial sector. He is a change management expert with proven track record on implementation of startup business operations driving growth and development through passion, initiative, and a blend of creative and operational strengths. A strong believer in technology as enabler throughout his career in banking and finance domain, he has implemented many systems and applications to suit the local requirements in different geographies resulting in business growth, customer acquisitions and better customer service & engagement. His key expertise also include designing operations, sales, collection, credit evaluation and risk management framework and has a proven track record of establishing systems, procedures and people management thereby contributing in a major way towards supporting business and products. Raj has also served on senior positions in biggest private sector lender ICICI Bank Ltd. in India (Asia) and one of the major banking players, First City Monument Bank Plc. in Lagos, Nigeria (West Africa). Until recently he served as Group-COO for Chase Bank Kenya Ltd based out of Nairobi, Kenya (East Africa).